Surfnav.com is the PUP that uses misleading techniques to prevent removal. Use Reimage to locate malicious components and get rid of them faster than with uninstall instructions. A full system scan blocks virus reappearance and prevents traffic to malicious domains. Surfnav.com is classified as a browser hijacker and potentially unwanted program (PUP). It has been spotted in the wild at the beginning of April 2018 attached to freeware and shareware in the form of web browser's extension. After infiltration, it takes control over PC user's web browsing activities by setting http://www.surfnav.com/ URL as a startup page. Besides, it foists fake Google-based search engine. Sounds good, need to admit. However, online community refers to this search as Surfnav.com virus, while cybersecurity experts recommend immediate Surfnav.com removal. 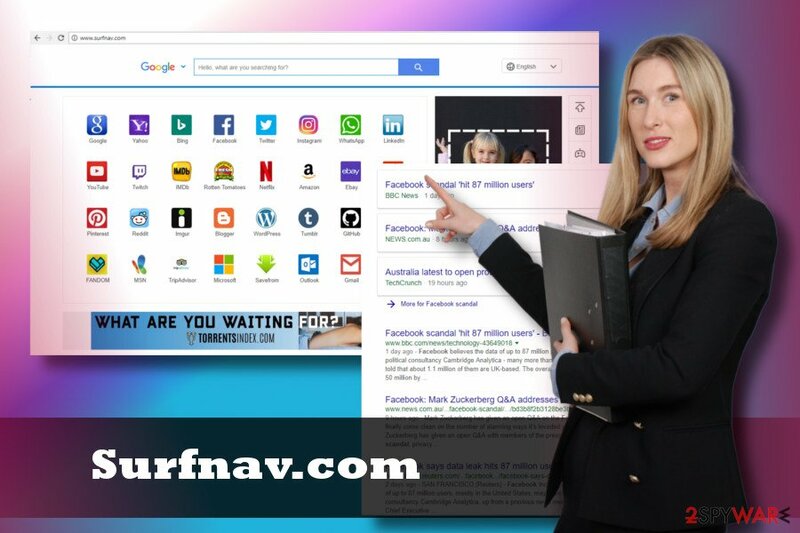 The main reason why Surfnav.com search puts enmity is its close collaboration with third parties and doubtful strategies for the implementation of affiliate marketing. Although this search itself does not intend to harm the system, it accepts third-party content for monetization without verifying it. 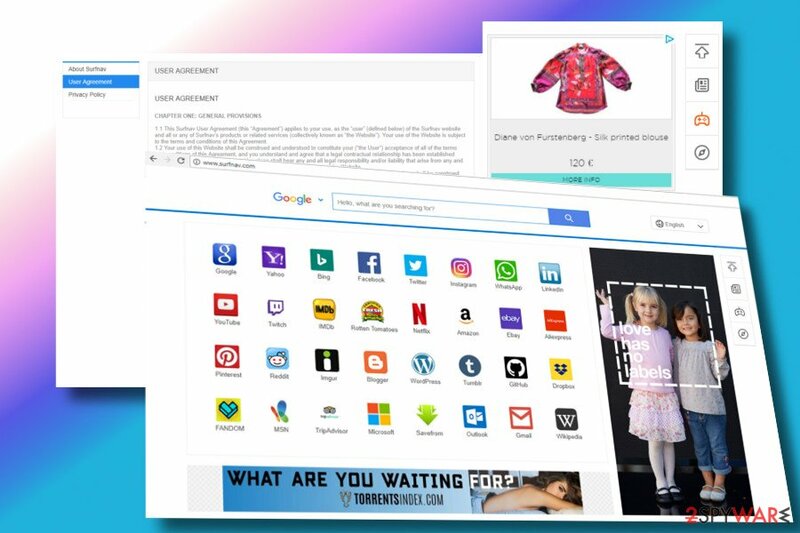 Once the Surfnav.com virus settles down on Chrome or another web browser, it starts generating pop-up ads and other intrusive content on its start page and random websites. Besides, it may alter search results uploading links to affiliated websites to the top. If you opt for secure web browsing, remove Surfnav.com from the system without delay. No one can assure you that the content it delivers is safe to encounter. In the worst case scenario, Surfnav.com redirects can ėexpose the system to phishing sites, misleading online surveys or support scams. Surfnav.com should be eliminated due to a high-risk of potentially dangerous content. The Surfnav.com URL does do not spread on its own. It's dependent on PUPs. Thus, to get rid of unwanted search site and restore default browser's settings, we recommend scanning the system with Reimage, removing all PUPs, and then resetting web browser. Indeed, PC's clearance can be initiated manually by following the instructions below, though automatic Surfnav.com removal is a much faster and more reliable way. This Chrome and Firefox extension isn't downloaded directly. That's because its standalone installer does not exist. Its developer relies on software bundling, i.e., pays freeware developers a particular sum of money for the extension being added to popular freeware, such as various download managers, games, converters, and so on. While such distribution technique is legitimate, there's a catch. Additional components, like extensions, add-ons or toolbars are installed by default unless the user selects Advanced or Custom installation. In case of Quick or Recommended installation setup, the package is not extracted. It's considered an indivisible unit, and by agreeing with the installation, the user gives consent to install the whole package. To prevent this from happening, opt for Advanced setup all the time and decompose the package. Surfnav.com is a non-malicious web browser extension that exhibits intrusive behavior and can expose PC's user to potentially dangerous websites. Therefore, a group of security experts with German specialists from Dieviren.de recommend people not to ignore the presence of this seaįrch site and switch to the trusted domains like Google. There's a couple of ways to remove Surfnav.com from Chrome or Firefox. You can either run a scan with a reliable anti-malware, which would detect and remove PUPs or initiate an in-depth analysis of installed programs manually. After the elimination of unwanted programs, reset web browser to get rid of the search permanently. Here, look for Surfnav.com or any other recently installed suspicious programs. Wait until you see Applications folder and look for Surfnav.com or any other suspicious programs on it. Now right click on every of such entries and select Move to Trash. When in the new window, check Delete personal settings and select Reset again to complete Surfnav.com removal. Once these steps are finished, Surfnav.com should be removed from your Microsoft Edge browser. Here, select Surfnav.com and other questionable plugins. Click Remove to delete these entries. Now you will see Reset Firefox to its default state message with Reset Firefox button. Click this button for several times and complete Surfnav.com removal. Here, select Surfnav.com and other malicious plugins and select trash icon to delete these entries. Click Reset to confirm this action and complete Surfnav.com removal. Here, select Extensions and look for Surfnav.com or other suspicious entries. Click on the Uninstall button to get rid each of them. Here, look at the Homepage field. If it was altered by Surfnav.com, remove unwanted link and enter the one that you want to use for your searches. Remember to include the "http://" before typing in the address of the page. Now you will see a detailed dialog window filled with reset options. All of those options are usually checked, but you can specify which of them you want to reset. Click the Reset button to complete Surfnav.com removal process. ^ Lee Mathews. Don't Let This New Windows Tech Support Scam Fool You. Forbes. A global media company. ^ Dieviren. Dieviren. Germany-based cybersecurity team. ^ Browser Hijacker. Techopedia. Insight and inspiration to IT professionals. This entry was posted on 2018-04-06 at 01:48 and is filed under Stealing programs, Viruses. You can quickly scan the QR code with your mobile device and have Surfnav.com manual removal instructions right in your pocket. How did you remove Surfnav.com?